Sometimes I feel that I dress differently than most people. 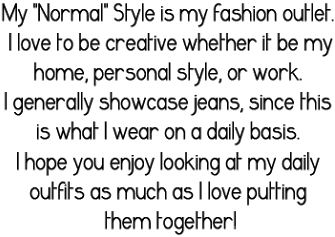 I wear the same kind of items, just in different ways. For example, most would wear slim jeans with these tops and shoes, where as I go for a more baggier feel. I do, of course, think that all women, ladies, and girls would look good in this kind of outfit, where as not all would look good vise versa. I believe this is a great style "for Every~body"...Catch my drift?